Here in the south of England, 2012 had the rainiest April and June ‘since records began’. It hardly ever rains in the southern UK these days, but when it does I still can’t resist looking out of the streaming window and delight in the fact that I’m not out riding for a living anymore. Although, in a way, I suppose I still am. I still recall a despatching June in the late 70s or early 80s when it rained every single day. At some point every day of that month I had to haul myself into my plastic body sack and splash about the streets of greater London, delivering stuff. I still hate wearing waterproofs any longer than absolutely necessary, but if you’re riding 10 + hours a day you’ve got to at least try and keep dry. EU52 = UK 42″ chest. Caveat emptor. 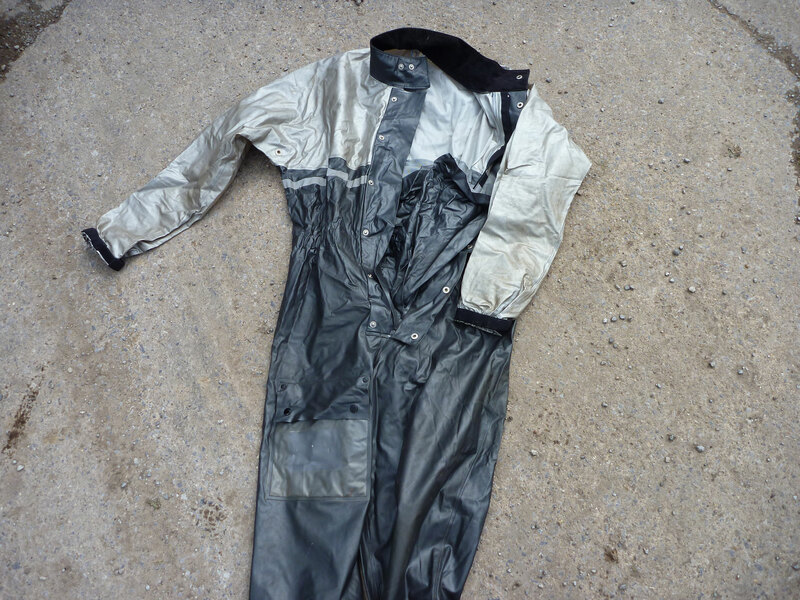 Back in the late 70s before Gore Textiles pulled off one of the biggest illusions in the history of rainwear, London despatchers by choice wore the classic silver-grey and black Rukka PVC waterproof, most commonly the lightweight jacket, or the one-piece (left). Have a look at this gallery of despatchers from 1986. As elegantly cut as you can expect, neither took too much space in a top box, nor constricted you too greatly once worn. I myself was too dim or tight to make this smart choice; I can’t recall what I wore, either a £5 trawlerman’s PVC smock, or a compressed polystyrene, one-piece balloon which, when allied with the ring-ding-ding of my MZ, would quite rightly irritate nearby drivers so much that they couldn’t resist taking a swipe at me just on general principles. On the right: 1980 review of the Rukka one piece from Bike magazine. PVC seems to get singled out for not being ‘green’ but it is waterproof like a bottle of beer is beer proof. 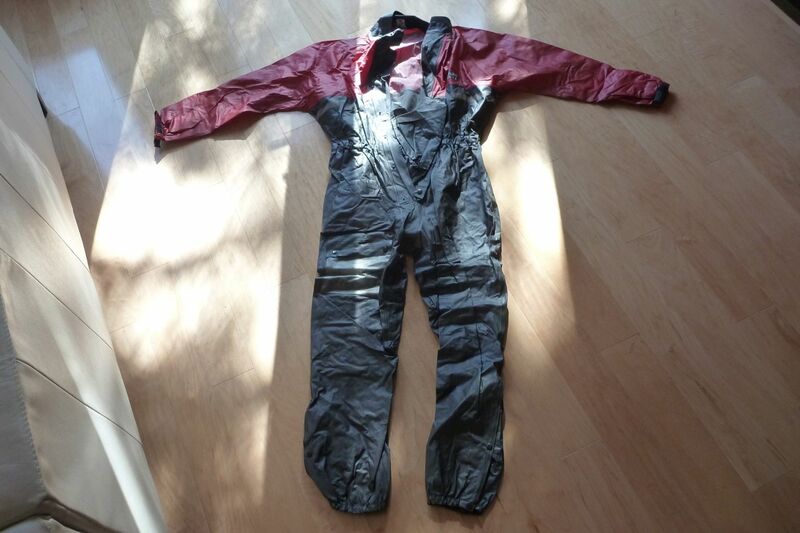 If it has a hydrostatic head, like proofed nylon or polyester tent fabric, it would be measured in miles, not inches. Of course PVC breathes as well as a canary in jam jar and so what you perspire stays close in a muggy microclimate which I grew to detest, especially when schlepping artwork up to the 5th floor with no lift to some receptionist that I thought I fancied. Actually I’m not sure it was just the inner damp that put me off. My vanity could also not bear being swathed in the amorphous, baggy blob. Whatever I looked like, it certainly wasn’t Tom Cruise out of Top Gun. 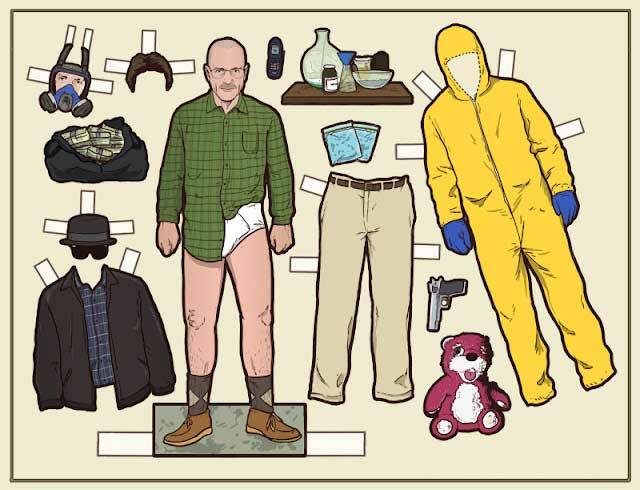 More like Walter White (right) suiting up prior to cooking up another batch of Blue in the superlab. Now I’ve finally caught up with my sodden past and picked up a used Rukka one-piece off ebay. First one at EU52 was too tight as an over suit. I wore the legs only with the top wrapped underneath my waxed Falstaff jacket through a 3-hour downpour and from the waist down at least, I wasn’t surprised to get home completely dry. 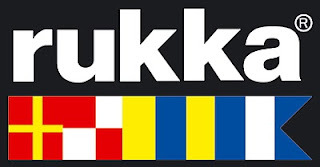 Who says men are crap at buying clothes but I now know EU52 equals UK chest 42 inches – a common trap when buying Rukkas. So I sat on ebay until a XXL EU 58 turned up for under 40 quid. (left). Plenty of space to easily climb in fully clothed without stressing the welded seams. Construction-wise, what a great garment it is! I don’t know when they stopped making them (they still produce ‘civilian’ cags in what is probably the same PVC polyamid fabric), but let’s assume my one-piece is some 25-30 years old. The material is still pliant, the leg map pocket has yellowed but other than that, the studs are all still there, the half zip runs smoothly and you have an overall feeling of quality that I’m not sure you’d get today in the similar proofed-nylon one-piece suits. 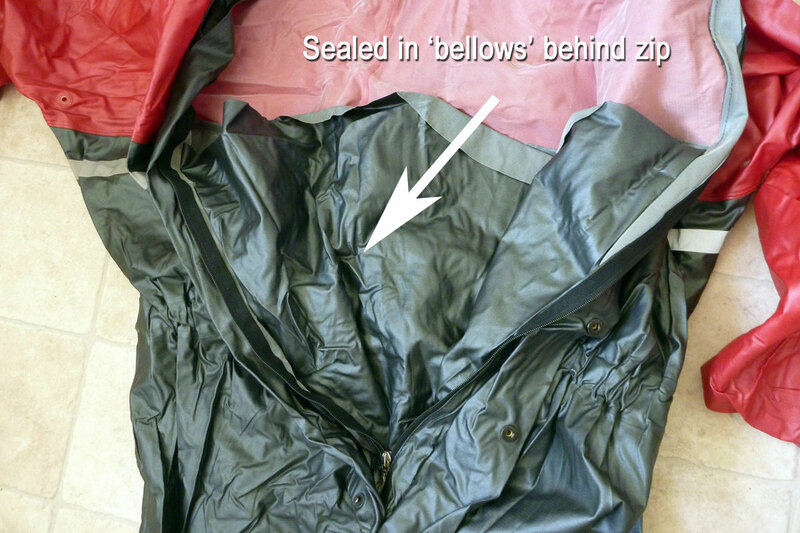 PVC is thickly layered from the outside and is easy to repair with glued patch or piece of tape. The front of the Rukka one-piece has an ingenious sewn-in, chest-high tongue/bellows (left), a bit like a hiking shoe, to eliminate anything getting past the studs or zip, bringing on that unwelcome cold-drip-in-the-crotch sensation. It rolls up and tucks in behind the studs with a zip, effectively making a chest-high waterproof barrier. Very clever. Not sure if anyone still makes anything like the classic Rukka. Cheaper proofed nylon seems the current way, and what Rukka make today for bikers is the usual over-designed, over-techincal and over-priced gear which, being based on breathables, will fail in the long run and requires special cleaning. If you’re looking for used Rukka pvc on ebay they usually turn up in great, barely used condition as anything less is barely worth selling. Avoid anything heavily repaired, dirty or with rusty studs. One problem was running my Aerostich Kanetsu electric vest without wires coming out the sleeves. Solution on the right and detailed here. And also search under ‘Protectorl (of London)’. They seemed to make identical garments in blue – same fabric and quality and era. 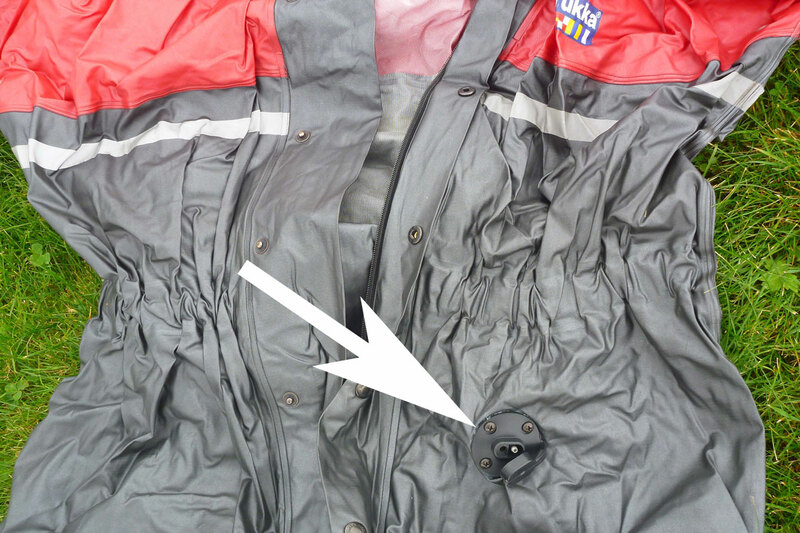 I came across a brand new Protectorl lined jacket for 25 quid (left) but it was again a little too small. Wait long enough and you’ll get what you want. Both brands come with quilted linings. 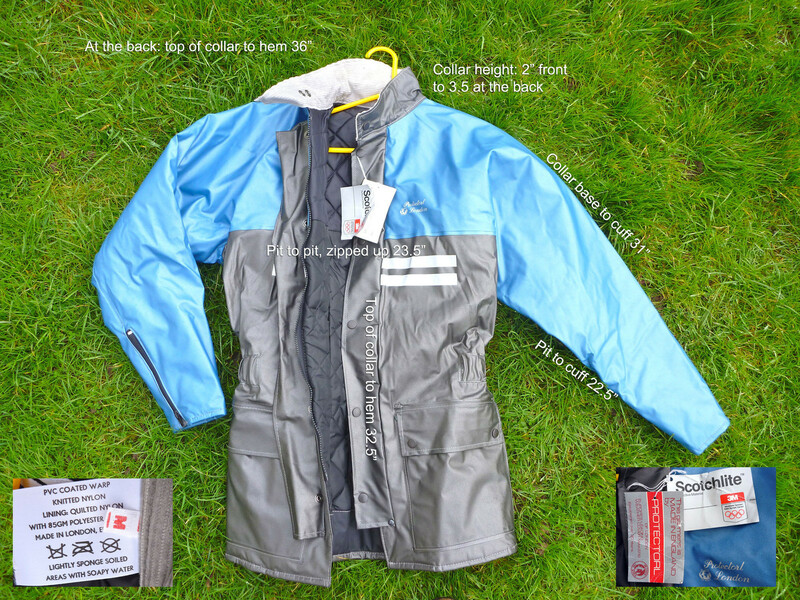 Me, I prefer unlined to roll up into a compact waterproof for rainy days only. My onesie weighs 1300 grams. 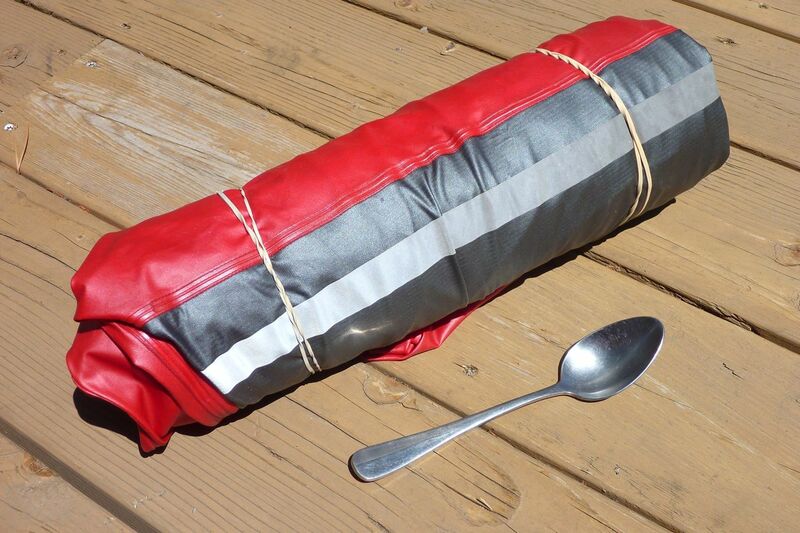 The day I start wearing a Rukka as a regular bike jacket is the day I start eating with a spoon. 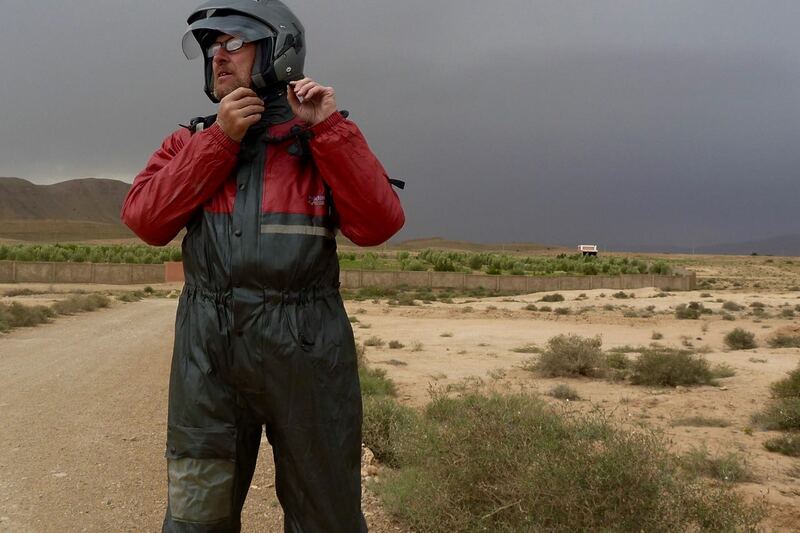 This entry was posted in Adventure Motorcycling Gear Reviews, AMH News, Jackets & Trousers and tagged classic rukka pvc motorcycle jacket, one piece waterproofs, Protectorl pvc jacket, pvc waterproofs, rukka one piece, Rukka PVC. Bookmark the permalink. Hi Chris, I’m the ex dispatcher and controller that arrived with he loud (English) Yank pal at the show on Sunday. 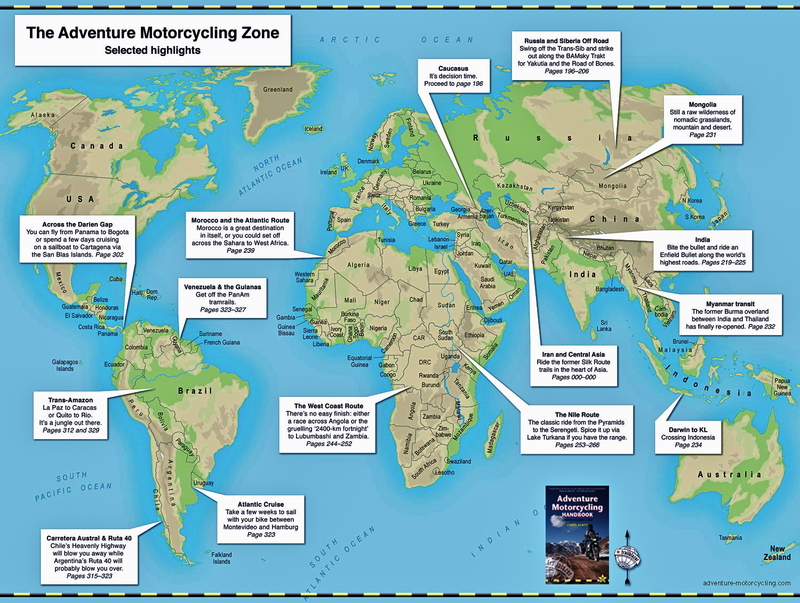 I read until p 214 Sunday night, then polished off the rest today – great memories of a nearly parallel career in bikes and (mostly) good times. You have evoked th era brilliantly. 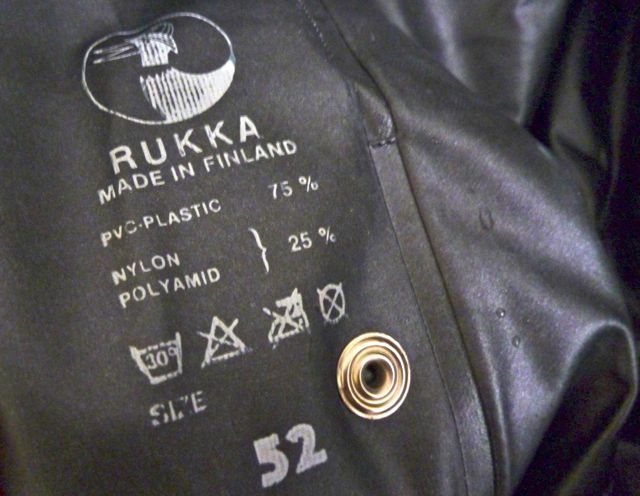 Regarding the Mao-like Great Leap Forward in waterproofs, I used to wear a lined Rukka jacket as day to day dispatching wear until the summer, or what passed for it some years. I couldn’t be arsed to keep stopping and getting properly togged up on iffy days, but after a few weeks wear, the sweaty inner micro climate could probably have outdone the average Petri dish. Turning it inside out and lobbing it in the laundry was the approved cure. I also well remember that wet June when it rained every day. I was running a VF400 Honda with thoughts of going racing, so I had bought some production racing compound red dot Metzeler ME33/99’s. It had rained so often that the Tarmac was scrubbed and the tires were brilliant. Quite a few scalps were taken on various favourite corners, and my wet riding improved no end. Nobody had snazzy body armour then, so learning to it right side up when chased on an urgent deadline was not only cheaper, but a lot less painful. Glad you’re enjoyed it David and great to see old despatchers finding the book. A lot of us still about, easing into our arthritis years. Had an ex-SD rider come to ExCel show with his copy to sign. I wore my 30-quid/30-year-old Rukka onesie to ExCel every day. Paid off on Friday I think it was when it pelted down. Got home dry as a bone. I remember buying a used racing tyre from Gus Khun’s with a profile like a Dairylea cheese triangle. And I don’t mean the curved outside edge. Maybe it was off a 125 racer? Can’t think what I was going to do with it other than thinking a racing tyre will make me into Eddie Lawson. Met up with an ex-SD mate last week in the West End. Just about every corner or junction we passed was the site of some bygone altercation/pull/scrape/prang/near-miss/pedestrian strike, like some high-carnage episode of Ogri. Did I say – issue of Practical Sportsbikes magazine out end of March is running a feature on despatching’s heyday. I have the BMW suit and confirm that I look ridiculous in it. It also seems to increase wind chill, but that may be common to all unlined oversuits? Had it four months and my wife’s still laughing. Hi Andrew, I suppose the wind chill makes sense but I prefer unlined as it’s more compact. If you buy huge there’s room underneath for more clothes I suppose, as well as extra amusement for all around. Yes, I read about CCM on HU yesterday – I’d better get over there for a closer look. It was great reading your article. I have been looking for a one piece over suit to go over my leathers. BMW variety looked the best, but bright yellow, and how much? Then I remembered I have a Rukka one piece suit in the garage. It is made by Rukka” boutique”, made for Honda. It is silver with yellow fluorescent stripes on the legs, shoulders and middle back. God knows how old it is but it’s in great condition, and I’m sure 100% waterproof (on the outside). I have now stopped the search and am looking forward to my first ride in the wet. I wonder how long it will take for someone to comment that I look like a space man, in my silver suit and helmet?